MKII has released the Swiss Made LRRP Milsub Circle-Y watch. The watch is MKII homage to the military issued Rolex reference 5517. 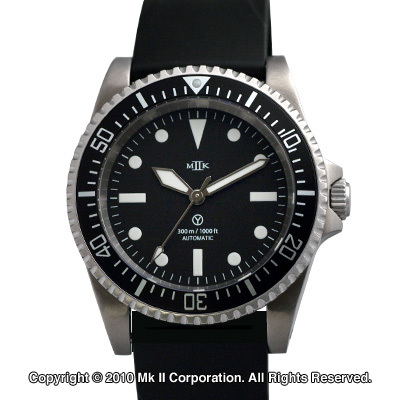 The watch is powered by an ETA 2893-2 (Elabore grade) that has been modified by MKII to only display the time. The watch is a basic 3-hand watch with no date complication. As mentioned earlier, the LRRP Milsub is a homage to the reference 5517 but with a number of 'improvements'. The watch now comes with a HRV (helium release valve) and a versatile screw-pin strap attachment. The watch comes in at 42.1 mm in diameter and will also be fitted with the double-dome sapphire crystal like the original. The watch will also feature the Circle-Y logo instead of the MOD Circle-T (for Tritium) on the dial. The Circle-Y logo is of course important as it is the second initial of MKII's founder and also the first initial of his screen name on watch forums.